It often surprises people to know that according to industry surveys, 30% of homes in the Sunshine Coast will suffer a termite infestation, many within the first five years of being built. That is almost 1 house in every three! All Pest QLD is the termite prevention and barrier specialist with over years of experience in pre-construction termite control. The Building Code of Australia (BCA) and Australian Standard AS3660.1-2000 requires by law that all new homes and renovations have some form of termite management system installed to deter subterranean termite attack. That system must meet BCA & Australian Standard performance requirements with documented evidence in order to satisfy the certifier before anyone can move in. Termite management systems usually have both chemical and physical components applied at progressive stages during the project. Which termite system to choose? When choosing the most appropriate termite barrier system for each project, there are lots of factors to consider and many different products on the market. As specialists in pre-construction termite barriers, All Pest QLD reviews plans, visits the actual site, consults with the builder and discusses options with the owners to ascertain what set up best suits their circumstances. Throughout the process, All Pest QLD as licensed contractors ensure the termite barrier system is installed correctly. The building supervisors must also ensure that barriers are not compromised by any other aspect during the building process like electrical and plumbing installation. All Pest QLD provides the builder with certified documentation detailing the management system installed including a sticker for the meter box. The builder provides these to the owner together with information about ongoing maintenance responsibilities and warranties. Owners need to be vigilant about regular maintenance on their property. All Pest QLD is usually contracted to do ongoing annual inspections to ensure barriers aren’t breached by things like new garden beds, water tanks etc. It is an ongoing process but the benefits of prevention far outweigh the costs of cure. There are essentially two groups of termite barriers which can be considered at the stage of new building work; physical barriers or chemical barriers. It is very important to note that the purpose of all termite barriers is to deter concealed entry (in other words they serve the purpose of forcing the termites into the open where they can be detected during the annual inspection process). This highlights how crucial it is to maintain annual inspections. Physical barriers are based on termite resistant materials which termites must circumvent in order to reach the building. They offer the benefit of a 'set and forget' long term approach. However certain types of physical barriers have weaknesses due to the fact that they can corrode or termites can move over them easily. Chemical soil barriers are insecticide solutions which are applied to the soil in order to create a zone which repels or kills termites when they come into contact with the chemically treated soil. They can work well and initially seem quite inexpensive, however the chemicals involved have a finite lifespan and can, over time, become completely or partially compromised by weathering and external factors such as landscaping or renovation. It is also important to ensure that application rates are consistent with the product label. A high level of vigilance is required to ensure adequate ongoing protection is maintained and the cost and ease of re-treating needs to be taken into account. TERM-seal Multi-Purpose Active is a highly engineered acrylic polymer-based liquid which upon curing forms a seamless, flexible, Termite resistant and waterproof membrane. Containing the active control agent Bifenthrin, this agent is modelled on Mother Nature's own insecticide pyrethrum (extracted from the pyrethrum daisy) which kills and repels Termites. Termite protection for internal walls converted into lined living areas i.e. : subfloors, basements, garages, etc. 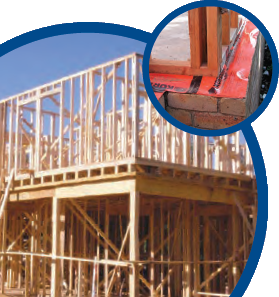 Construction joints, step downs, cavities, any area where an effective Termite and or waterproof barrier is required. Installer nationally by trained and accredited installers. Each year in Australia, termites cause more damage to homes than fires, floods and storms combined. One in five homes is affected by termite damage, often resulting in extensive damage and then expensive repairs. The damage caused by termites is not covered by household insurance. The full burden of meeting the costs associated with repairing costs rests with the owner. So it is clearly crucial to protect the future value and lifespan of your investment with a quality termite management system that best suits your individual building site requirements. The choice of termite management system can be confusing given the range of options available. 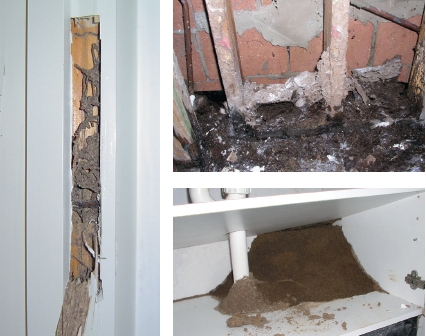 Due to the regulatory environment in Australia we are lucky that most termite management systems must meet certain standards and therefore most provide at least a minumum degree of protection of the building structure. But, as with all things in life, a little knowledge can help in the choice between a basic level of protection and the best level of protection. Australia has approximately 300 species of termites but only about 15 species are regarded as economically damaging. The remainder play an important role, breaking down plant matter in the natural environment. The incidence of termites, and thus the probability of attack and severity of damage caused, generally increases the further north you travel in Australia. As referred to above, termites are social insects and a single colony can contain millions of individuals. Within this structure will be a number of different castes (eg. workers, soldiers and reproductives) and each perform different functions to help maintain the health of the colony. Each of these castes are morphologically adapted to meet the requirements of the task it performs. Most activities are performed within a closed system of underground galleries where there is protection from temperature and humidity extremes. They emerge from these underground galleries to feed on cellulose based material (whether it is fallen logs or the frame of a building). The winged reproductives (alates) also emerge when the conditions are right (usually in late spring or early summer) in order to mate and establish another colony. Many of these termites are able to build protective mud-tubes, from the soil, up a non-edible building element (eg. brickwork) or around physical barriers in order to reach a food source (such as bearers and joists). Even if an effective termite barrier has been installed termites can still therefore enter a building by bridging the barrier. Annual termite inspections by a qualified professional are therefore essential in order to detect such bridging of barriers. So wherever (and whenever) you're planning to build a new dwelling, be sure to have your site carefully checked for their presence; and be sure to install a termite barrier which gives you the best level of protection. 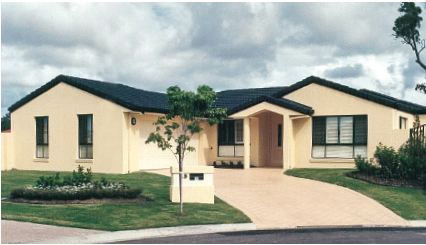 During the mid 1990s Kordon Termite Barrier was the first product which represented a new class of termite management system; now referred to in the Australian Standard for Termite Management as 'a chemical in a non-soil matrix'. Kordon is a pre-fabricated sheet material comprising a layer of webbing to which a precise and consistent dose rate of the insecticide deltamethrin is applied. The webbing is then sealed between two robust outer sheets of plastic. This provides the best features from both world. Kordon Termite Barrier has been developed and is marketed by Bayer, one of the world’s leading life science companies. Bayer Environmental Science is the market leader in the field of pest management solutions that help to protect our environment, lifestyle and investments. Our global resource network is further complemented by our in-depth knowledge and experience in the Australian termite market. With a commitment to Sustainable Development, we are focussed on developing highly effective solutions which not only provide a high level of environmental and human safety but are also consistent with our published goals of greenhouse gas emission reduction. Bayer is a leader in sustainable development within the industry and has been included in the Dow Jones Sustainability World Index on a number of occasions and is the first European Chemical company to be listed in the Carbon Disclosure Leadership Index. Kordon is manufactured in Australia, in the context of transport and greenhouse gas emissions associated with that, it therefore offers distinct advantages over other similar products which are imported from overseas. The development of Kordon has been entirely consistent with the company objectives. Since its development Kordon has offered real advantages over traditional termite management practices. The encapsulation of a chemical termiticide into a pre-fabricated physical sheet material means no exposure to the environment of soil applied termiticides. This makes it ideal for environmentally sensitive sites requiring sustainable, ecologically responsible solutions. Testing has shown that no allergens are generated from Kordon and thus it is an ideal choice for allergen free housing. The fact that Kordon has so frequently been the product of choice in many public buildings (eg. schools, hospitals and public buildings) is testimony to its excellent safety profile. Bayer has been featured continuously in the Dow Jones Sustainability Index World since 1999. In 2009, the Group was rated in the global Carbon Disclosure Leadership Index (CDLI) as the world’s best company. Bayer is the only European chemical and pharmaceutical company to have been listed in the CDLI five times in succession. Our annual Sustainable Development Report and the website www.sustainability2008.bayer.com provide comprehensive information on sustainable development at Bayer. National Certification - Kordon Termite Barrier is CodeMark Certified to the requirements of the Australian Building Code. Preferred by Architects and Building designers - Independent market research has shown Kordon to be the preferred method of termite protection specified by architects and building designers. APVMA Approval - Kordon has been fully assessed by independent federal regulatory bodies in relation to efficacy, health and safety and environmental impact. Kordon is the only chemical barrier in a non-soil matrix in the Australian market to have a label which has had claims for a minimum period of protection of 15 years fully supported by independent regulatory body assessment. In Addition, Kordon has obtained the internationally recognised ISO 9001 - 2000 Quality Management certification. Completely impregnable. Guaranteed. Kordon has undergone extensive testing by CSIRO and other independent Australian authorities since 1989. In all evaluation work conducted, Kordon has never been penetrated by termites. Furthermore there have been no penetrations of the product by termites in any of the 120,000+ installations which have been made since 1996. Kordon Termite Barrier complies with AS 3660.1 and the BCA. Kordon Termite Barrier has no effect on the structural design of the building. For your complete peace of mind, Bayer provides a comprehensive structural timber replacement product warranty against penetration of the product by termites. Bayer, and the accredited installer used, will provide a complete set of documentation to the building owner upon completion of the Kordon installation project. These documents include the Kordon Product Warranty; the Certificate of Compliance to the Australian Standard and the manufacturer’s specifications; the Installation Report detailing where Kordon has been installed; and the annual inspection Meter Box Sticker to record regular inspection details. Kordon is installed only by accredited Kordon installers who have been thoroughly trained by Bayer Environmental Science. This process ensures work on every installation is carried out precisely and correctly. The accredited installer network has been trained by Bayer in the correct installation of Kordon Termite Barrier. The existing installer network has a high level of experience in the pest control and/or building industry. Bayer Environmental Science has a team of six individuals who are associated with Kordon. This range of in-field support staff based across the Eastern States to head-office support staff based in Victoria. Kordon can and has been used on many highly sensitive building sites. For example, world heritage-listed areas on Fraser Island, hospitals, schools and childcare centres where many other termite barrier systems could not have been installed due to environmental and health-related considerations. Kordon is manufactured in Australia and has been tested and developed to specifically suit Australian conditions. Every year, termites cause more damage to Australian homes than floods, fires and storms combined. At least one in five homes are affected and the cost of repairs regularly runs into thousands of dollars. Even more disturbing is that the destruction (and expense) termites cause is not covered by normal household insurance. So whether you're planning to put up a new home or renovate an existing one, it's vital that you comply with compulsory building regulations and invest in protecting your most important asset. Because wherever there is timber there are termites looking for their next meal. 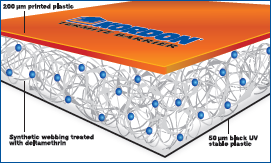 For cost-effective, longterm protection, you can't go past having a Kordon Termite Barrier installed. Kordon is more than just termite proof. Many termite protection products act solely as a physical barrier, allowing the foraging insects to search up and down their length until they find a gap or weakness to enter through. Kordon contains deltamethrin, a synthetic derivative of naturally occuring pyrethrum. Insects are naturally averse to deltamethrin and, given the choice, will not go near it. Repeated trials have shown that as soon as termites even get near the Kordon barrier they turn and go elsewhere for their food. Backed by the global resources of Bayer, one of the world's most trusted names in health and environmental science, Kordon's innovative plastic-sealed design makes it the ideal choice for allergen free housing and environmentally sensitive sites. It's the reason why Kordon is so often preferred for use in schools, hospitals, public buildings and quality-conscious new residential developments. Kordon's design is unique. It comprises a special layer of webbing to which a precise and consistent dose of deltamethrin is applied. This is then sealed between two robust sheets of quality UV-stable plastic to deliver environmentally safe termite protection not only guaranteed to last, but fully conform with the Australian Building Code, AS3660 and ABCB certification No. 2003/001. A unique Australian made and designed product, Kordon has been extensively tested over a 20-year period by Bayer, the CSIRO, State Forestry Departments, State Building Authorities and Building Design Academics. Kordon has undergone extensive testing by CSIRO and other independent Australian authorities since 1989. In all evaluation work conducted, Kordon has never been penetrated by termites. Furthermore there have been no penetrations of the product by termites in any of the 120,000+ installations which have been made since 1996. Perimeter systems will vary according to soil type and construction method, the Altis systems can be adapted to requirements. There are two products which can be used to meet the requirements to provide a complete external barrier. The two products are the 150mm wide perforated sheet with one dripper line and the 300mm unperforated sheet also with one dripper line. These two products can be used singularly or in combination. All Pest QLD as a accredited Altis installer can advise you on what best suits your situation. Altis complies with the requirements of the Australian Standard 3660.1-2000 and the requirements of the building code of Australia. Laboratory work, field trails, engineering reports and computer simulations support these opinions. Altis are constantly re-appraising their system, and CSIRO opinions are updated frequently. Engineer reports show that the flexible pipes bend but will not break if subjected to soil movement, a common problem in clay soils. The perforated plastic membrane will prevent excess addition of water to clay, and the Altis system can use one fifth of the normal water used to deliver chemicals. (Water simply adds to clay movement). The emitters do not allow foreign materials in or out of the pipes. Where a clay site has only a minimum sand bed due to supply constraints, Altis will still deliver chemicals evenly and effectively (subject to regular inspection and required maintenance by All Pest QLD in accordance with a warranty contract).